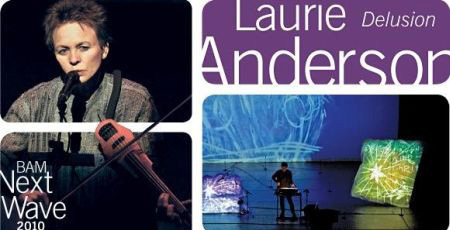 Next Week: Laurie Anderson at BAM. Save 25%. "A singer-songwriter of crushing poignance"
"High priestess of the experimental"
"[Anderson] works her magic, and the piece, with its contradictions, shafts of insight and splinters of wit lingers with you…like a powerful dream." Simultaneously contemplative and whimsical, pioneering storyteller Laurie Anderson's latest work fuses music redolent with Tibetan temple horns and Arabic strings with striking visual elements, including animation, video, and film sequences to create a phantasmagoric dreamscape of short stories that explore themes of longing, identity, and memory. *Offer valid for performances Sep 21—23 & 28—30 only. May not be combined with other offers, not valid for day of show purchases, and not valid for prior purchases. Subject to handling and facility fees and availability. Maximum of 4 discounted tickets per household. Offer good through Sep 29, 2010.